The system dumped snow from the Rockies to North Carolina to the Northeast. The major winter storm that dumped snow from the Rockies all the way to North Carolina and parts of the Northeast is heading for the Atlantic Ocean. Some areas saw 10 to 20 inches, while North Carolina also got half an inch of ice. The storm disrupted travel on interstates across the U.S., likely factored into two aircraft incidents and caused thousands of power outages. About 100,000 customers still were without electricity as of this morning. With more than 11 inches of snow in St. Louis so far, it's the city's biggest storm in five years. Reagan National Airport in D.C. reported more than 10 inches, that area's biggest snowfall since the January 2016 blizzard. (ABC News) The winter storm heading out to the Atlantic Ocean left a cold blast in its wake. 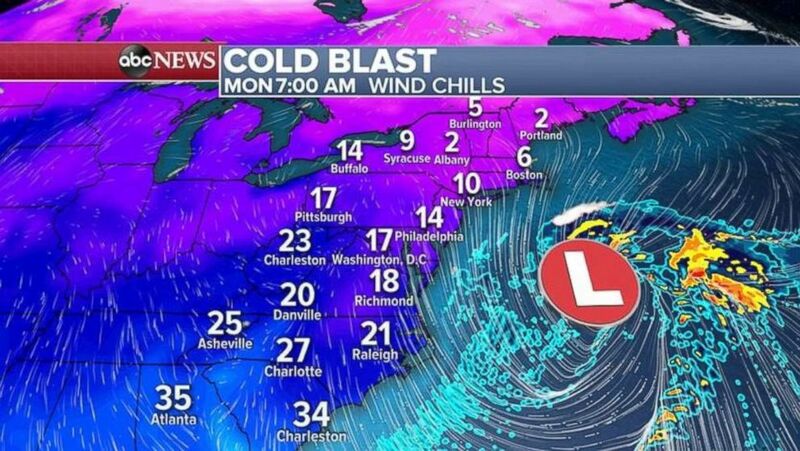 In the storm's wake, a cold blast is rushing down into the eastern U.S., with wind chills in the teens and single digits this morning for much of the Northeast. Conditions likely won't improve by tomorrow. With extremely cold temperatures and a fresh snowpack in the mid-Atlantic, freezing and re-freezing of snow and ice are possible, which could lead to dangerous travel conditions. Out West, more Pacific storms are in the forecast. The first few waves are targeting Southern California early in the week, while a potentially major Pacific storm could be targeting the whole West Coast by midweek. Flash flood watches, wind alerts and winter storm warnings have been issued in the region. (ABC News) The latest in a series of storms is striking the West Coast today. 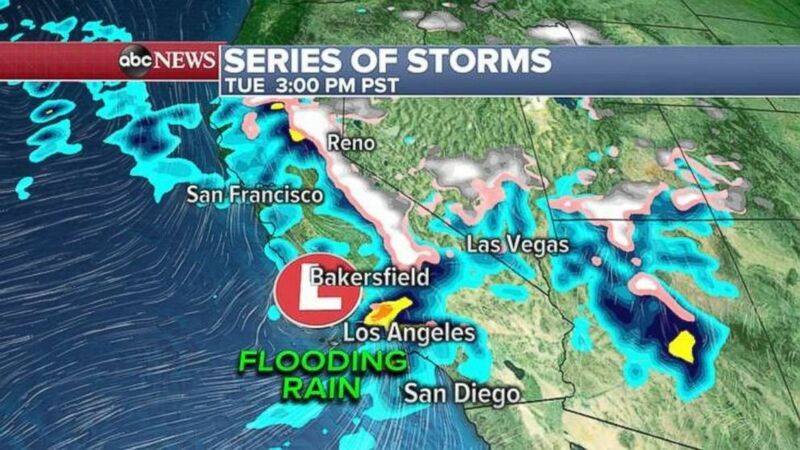 (ABC News) Parts of Southern California may see flooding rain on Tuesday. 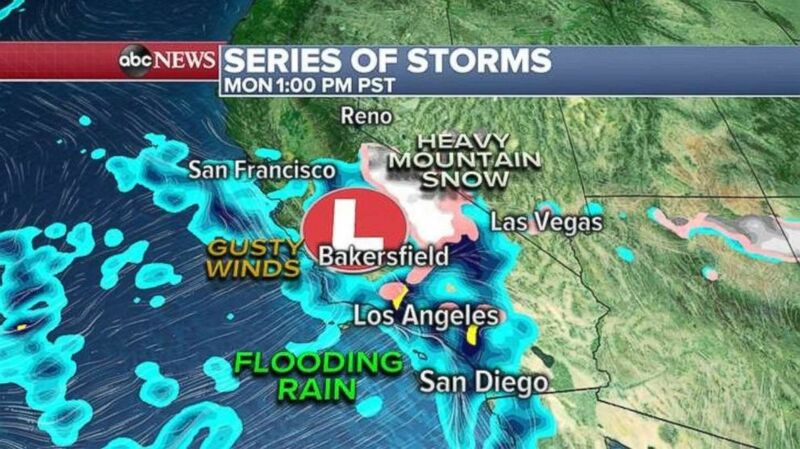 The next Pacific storm is expected later this morning in Southern California, bringing with it potentially flooding rain, winds of more than 60 mph and heavy snow in the mountains. Another Pacific storm is due to sneak in tomorrow, with more significant precipitation possible. Locally, parts could see more than 5 inches of rain as mountains see 1 to 2 feet of snow. Mudslides and landslides may accompany flash flooding in Southern California, especially in recently wildfire-scorched areas. Another major Pacific storm also could be hitting the coast as early as midweek. This system likely will deliver even more rain and snow, including several feet in the Sierra Nevada with wind gusts at the highest elevations approaching 100 mph. 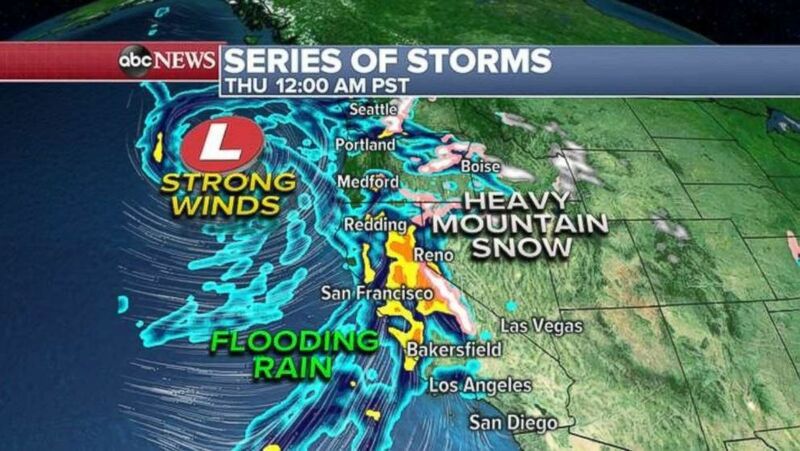 (ABC News) Another storm is heading for the West Coast.